India is a country with a complex religious geography. There are many pilgrimage sites in the country out of which some holds a strong traditional and holy mythological background. Dwarka is largely visited my numbers of pilgrims because of its strong association with Lord Krishna. Dwarka is a town located at the cost of Gujarat in Jamnagar district. Out of so many sacred cities of India, today we will seek a deeper knowledge of Dwarka city. Dwarka is best known for its origination which dates back to 3200 BC. Yes, it is older than the Harrapan civilization. Dwarka city is mention in Skanda Purana, Vishnu Purana, Srimad Bhagavad Gita and the Harivamsha. As per the mythology of Hindus, Dwarka was the city where the eighth avatar of Vishnu once lived. Dwarka city was considered as the kingdom of Lord Krishna. Lord Krishna who was born in Mathura, killed his Uncle Kansa who was the tyrannical ruler of the Dwarka city. It was Lord Krishna who built the city. Traditionally, the city of Dwarka was identified as Dvaraka or Dvaravati. It was even mentioned in Mahabharata as Krishna’s city. How Did This Holy City Get Swept Away By A Great Wave Of Water? It was stated by many ancient legends of Dwarka city tells us that it was submerged by a great wave of water long ago. It was still ignored by arachnologists and contemporary historians. But as per recent findings of the new science, it produces accurate models of ancient shorelines. Dwarka city was rumoured to be submerged in water over 30,000 years ago. There are many discoveries about this legendary tale but it’s still difficult to prove if these tales are factual or just a myth. 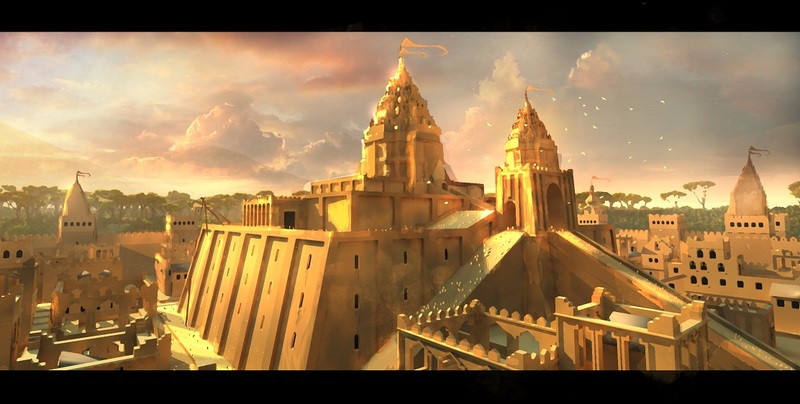 As per the tales mentioned in Mahabharata, Dwarka city was devastated due to the curse of Gandhari. Gandhari was the mother of Duryodhana and wife of the King Dhritarashtra. Gandhari was dejected to here that at the end of the Kurukshetra war she lost her 100 sons. When Lord Krishna went to her to offer his condolence, she in wrath questioned Krishna about the war. She asked him though he had the power to stop the war why he did not end the war. She further added that it was due to the fate of King Dhritarashtra to be born blind and suffer from the pain of having his 100 sons killed. But she had done nothing wrong in her past life to suffer from this devastating situation. Out of rage and desperation, she cursed Lord Krishna and his entire Kingdom. She said that as she has to suffer through the pain of losing her sons, Krishna will go through the pain to see his entire Yadava clan die right in front of his eyes. Not only this she also cursed that Lord Krishna’s kingdom will burn to ashes. It was further added that all the sons of Lord Krishna will die in a massive fight which will happen in Dwarka. And at this uncertain happening Krishna will be left powerless to stop the war and control the destruction of the Dwarka city. This solemn utterance of the Queen Gandhari to harm or punish Lord Krishna is considered as a reason of demolition of Dwarka kingdom. Mahabharata is a historical base to this tale. 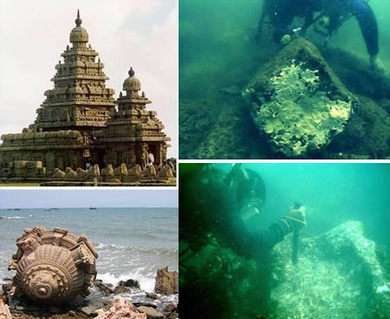 In front of the Dwarka city’s famous Dwarkadhish temple, there has been archaeological excavation to prove the fact of its getting submerged into the sea. This excavation dates back to 15th century BC. There is another story which states the submergence of the Dwarka city. Here the 36 years of Kurukshetra war a messenger asked Vasudeva Krishna that in order to save Dwarka city, Vrishnis should take a bath in the sacred waters of the ocean. Hearing this The Yadavas along with their wives travelled to Prabhasa and settled there. Each of them resided in the habitation assigned to them. They had an abundance provision of edibles and drinks. The food which was to be served to high-souled Brahmanas was mixed with wine. This food was later offered to apes and monkeys who enjoyed it, of which drinking formed the chief feature. This aroused a dispute among Satyaki and Kritavarman about the wrong they did during Kurukshetra war. This dispute turned out into a massacre, which resulted in the dissolution of the Yadava heroes. Arjuna arrived at Dwarka after this incident and asked the chief officers to leave Dwarka within 7 days. He told everyone that Dwarka is going to sink in the ocean. Arjuna after addressing inhabitants of Dwarka proceeded to the place where Vrishinis were slaughtered. Arjuna evacuated the Dwarka island on the 7Th day. After all the inhabitants left the Dwarka Island, the ocean flooded the Dwarka city. It is said that on the last journey before death Pandavas saw the Dwarka city covered by ocean. It is also believed that submergence of the Dwarka kingdom could be due to the tsunami. In 1,500 BC experts and closely associated with the city suggest that after the tsunami the city was covered by the ocean. After the death of Lord Krishna, Arjuna took Krishna’s grandsons to Hastinapur. According to YS Rawat who was the director of the state archaeology department, this incident could be due to the tsunami. It could be possible that people did not know that such activities of the sea are known as a tsunami. The secretary of the Shardapith Dwarka, Swami Sadanand Saraswati says Dwarka must be devasted by the oceanic activities. He further added that According to Bhagavad Gita, Lord Krishna said once he leaves this world there would be no one to save Dwarka. According to other discoveries, it was stated that the town of Dwarka was destroyed and reconstructed several times. In between 1983-1990 this well-forfeited town of Dwarka was discovered which extended more than half a mile from the shores. After conducting underwater archaeological explorations there is certain evidence which supports the facts this city could be submerged due to the activity of the sea. They also mentioned that the reconstruction of the city proved to be a prosperous port town. And it was even in existence for 60-70 years in 15th century. That is how this city is known as Atlantis of the east.